The Bickles Foods factory exemplifies the fits-n-starts pace of progress on my projects. This particular structure is based upon an Art Curren article in the October 1985 Model Railroader, an HO scale kitbash of two Con-Cor (now Heljan) Superior Bakery kits, but I’m doing some things differently. I didn’t want to lower the main walls the way Curren did, and I wanted the rooflines a little less chaotic. These decisions, and some differences between the HO and N scale versions of the kit, left me with two short walls that couldn’t be fashioned from the kit parts. 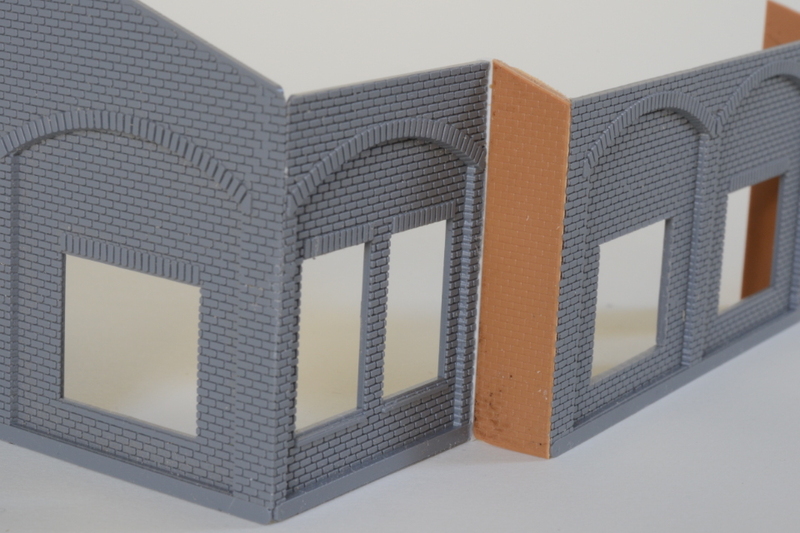 The hobby shop, after rooting around in their supplies, provided a scruffy-looking Kibri brick-wall tile from which the needed parts could easily be cut, but the brick pattern wasn’t an exact match to the Heljan walls. I set the project aside to consider my options. That was three years ago. I unearthed the project’s pieces this week, laid them out, and concluded that the Kibri tile was indeed the best way to go. Any disparity between the brick patterns wouldn’t be apparent in the painted, finished structure. I cut the walls and began assembly. Did I need three years to make this decision? Probably not, but that’s what sets a hobby apart from real life—I can take as much time as I please. The only deadlines are self-imposed.